I have only been riding a little over 2 years, but I love it! I bought my Harley new a week after taking the MSF course. I call him "Flipper." He is white gold pearl and pewter pearl. My bike is pretty special to me and I am constantly adding things. So far, I've added front and rear crash bars, luggage rack, windshield bag, J&M radio (so I can talk with hubby and so I can play my iPod), Kuryakyn ISO grips, chrome clutch and brake levers, chrome master cylinder, front fender skirt with concho, rear mud flap with concho, passenger foot boards with concho covers, flames derby and air breather covers, nostalgic foot board inserts with matching brake & shifter pedals, HD script shifter linkage, AND 2" Rush slip ons and stage 1/EFI download. I have put 16,000 miles on Flipper riding all over Mississippi and into AL, FLA, LA, TN, AR, MO, and TX. It's indeed a great ride and you've apparently use it to visit some nice countryside. 40,000 on my 2005. I'd love to feature your photo on my BAG-R-BOX Saddlebag Insert Tray Facebook page. Just bought an 09 Heritage Classic today. Brand new Harley owner. So glad to hear you love this bike. I am looking forward to the wind in my face as well. I chose the 2009 Heritage in June of 2009 because it balanced easy and I loved the nostalgic look. It was brand new when I got it and now has over 16,000 miles. Thanks for the comments. 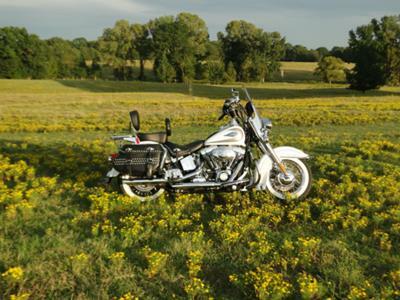 I currently ride a sporty, and test drove a 2012 Heritage at one of the HD demo events! I loved it. The bike handles so nice and is so well balanced. I will have one by the end of next year. I have put 8,000 miles on my sporty this year and can't wait to upgrade. Your bike is beautiful! Enjoy. Wow!!! That is a beautiful bike!!!! What made you choose the 2009 and how many miles?? Flipper is truly gorgeous!!! Congrats! I hope to be in the Harley family one day!!! Love this picture of your bike. You can tell how much you are enjoying "Flipper" from all of the wonderful extras you are putting on her/him?? Question...are you the person that mentioned how Flipper got his/her name - Miami Dolphin fan on the forum today?